The purpose of the chart is to give you a guideline how you can introduce colours in your life in a fun and easy to use way. The colours you will find in your chart help you to charge up, relax or balance your energies. You can use them when you choose your home decor, clothes, etc., accordingly. First I work out your colours and create the chart, as you see on the image. Of course the colours will vary from person to person. Your key colour & its meaning – It shows your talents and can highlight areas you need to work on. 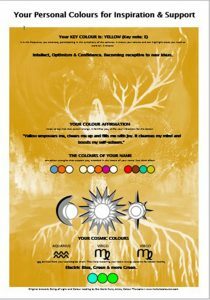 The letters of your name also carry energies that can speak a lot about you.I show your colours in the chart for you. Your Cosmic Colours help restoring your basic energy patterns for better health on all levels: physical, mental, emotional & spiritual. You can meditate with them or surround yourself with them.